Riesling by Domaine Dawnelle of Derwent. . . .
Michael O�Brien was born and raised in the Riverina, immersed in the land, farming and winemaking for many years, his earliest memories stretch back to the days of vintage festivities and the pungent grape marc aromas that filled the distillery where his grandfather made spirit. Having relocated the family to Tasmania in late 2008, with a view to determining the most desirable site, the fortuitous topography of Domaine Dawnelle was discovered in less than two years. Be it chance or the right place at the right time, a late evening prospect at Granton Heights revealed a plethora of riches so perfectly suited to Pinot Noir and Chardonnay. The eight hectares of Domaine Dawnelle are located in rural Granton, Tasmania�s most eminent terroir. At 160m above sea level, perched atop a north facing chalk ridge, the shallow topsoil reveals a myriad of fossilised marine shells over chalk and limestone sub layers. The vineyard, still in its developmental stage has been planted with the classic Burgundy varietals, Pinot Noir and Chardonnay. In addition, an idyllic patch of land has been planted with Riesling. Planted in 0.2 Hectare blocks, enabling the most meticulous management of varietal clones and micro ferments. 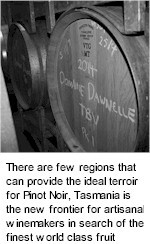 Tasmania, family and Pinot Domaine Dawnelle's raison d�etre. The fruit of Tinderbox Vineyard articulates the intricacies of Tasmania�s cool climate sub regions. Planted in 1994, the mature vines overlook D�Entrecasteaux Channel. The fruit reflects the unique characteristics of the vineyard�s low yielding basalt soils of volcanic origin and the microclimate which is largely influenced by the surrounding sea breezes. Elsewhere Vineyard is located in Huon Valley, the second Pinot Noir to join the Vineyard Designate Series. 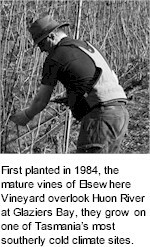 First planted in 1984, the mature vines overlook the Huon River at Glaziers Bay and are amongst some of Tasmania�s most southerly cold climate sites. Kinvarra Vineyard is on the picturesque Upper Derwent Valley, the original Pinot Noir block was first planted in 1990. All Domaine Dawnelle's fruit is hand picked, chilled and de-stemmed in preparation for a whole berry cold soak to enhance aromatic complexity. The colds soaks also facilitate a slow restrained ferment that will only peak in temperature when miniscule residual sugar remains. Due to a number of small batches, occasionally ripe stalks are introduced to provide natural tannin. Hand plunging the red wines 3-4 times daily during active ferment and a period of extended maceration, helps promote the accumulation of desirable phenolics. Wine is drawn off from the fermenter by gravity and the pomace manually basket pressed. All pressings of designated batches are gravity fed to French oak barriques for b�tonnage prior to malolactic fermentation. Pinot Noir is matured for no less than 15 months on lees (sur lie) before gravity racking and preparation for bottling. Like a true craftsman, O�Brien has adopted traditional hands on winemaking techniques. Gentle handling of Pinot Noir is paramount for genuine expression of the vineyards terroir. Wines are purposely crafted to exemplify class, elegance and longevity.